Artificial environments designed for space have thus far remained totally utilitarian, but what if more aesthetic considerations were brought into the mix? 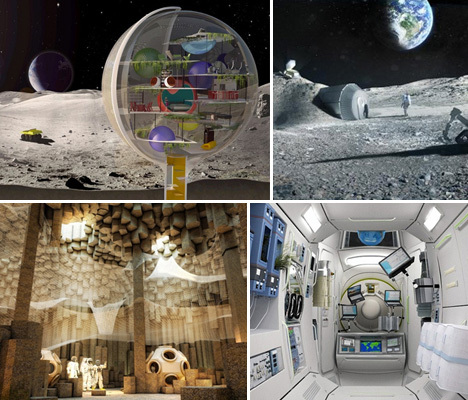 These design concepts range from constantly morphing art galleries for the International Space Station to a moon base built using existing 3D printing technology and designed by a renowned architecture firm. 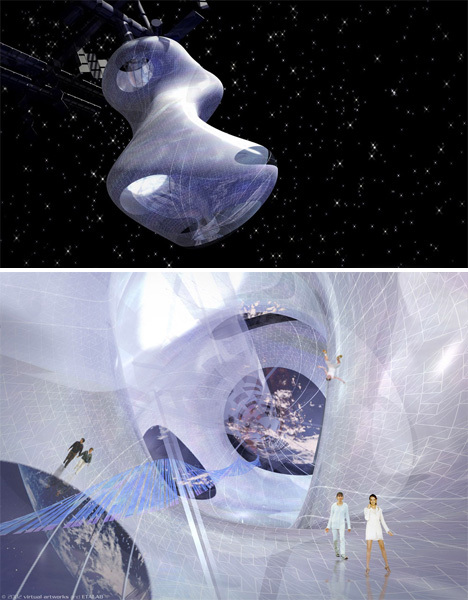 Artists, designers and other creatives haven’t exactly been included in the process of space exploration thus far, but this project by ETALAB aims to change that with an outer space gallery where artists, curators and visitors interact with works of art and architecture in zones of zero and partial gravity. Docked at the International Space Station, ‘Tate in Space’ features a flexible ‘envelope’ made from a smart material based on biomechanics that enables the space to constantly shift in shape. 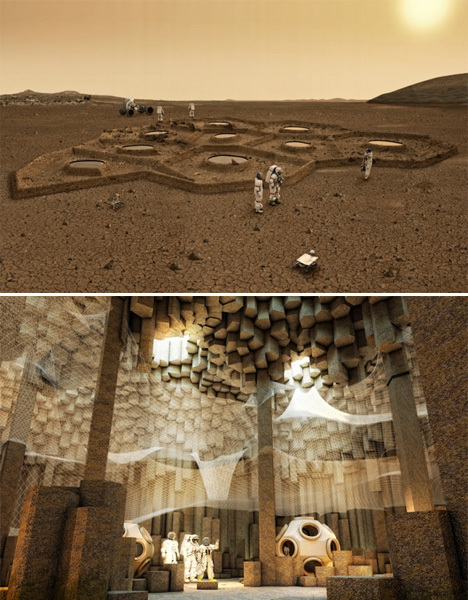 Solar-powered robots could excavate dwellings for humans on Mars before the people ever arrive in this concept by ZA Architects. Choosing areas where the basalt rock has formed into hexagonal columns, which can be easily removed to create cathedral-like spaces, the robots would weave web-like structures from basalt fibers to create floors at various levels within the caves. 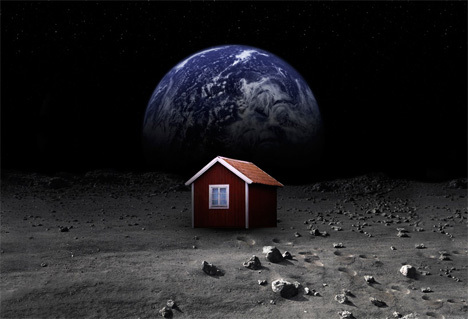 A crowd-funding initiative will send a self-assembling house to the moon in October 15th on SpaceX’s Falcon 9 spacecraft. The building, designed by American aerospace company Astrobotic, will be made from a thin sheet of specially developed cloth stretched over a carbon frame. Once it’s placed on the lunar surface, it will fill up with gas and stand erect within five to fifteen minutes. 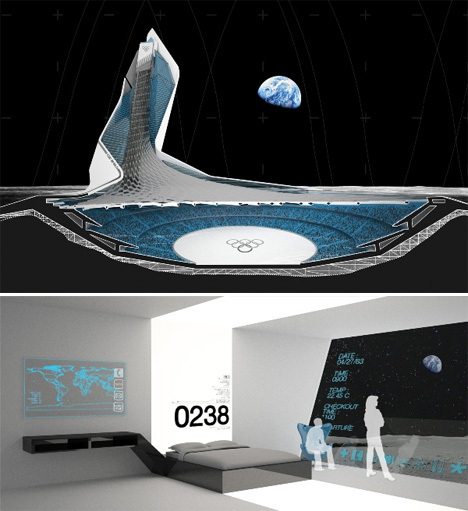 Russia’s plans for a space hotel would house seven guests in four cabins, 217 miles above the surface of the Earth. The hotel would also function as accommodations for scientists on space-related missions, and as an emergency blowhole for astronauts aboard the International Space Station. A five-day stay will set guests back $100,000 in addition to the half-million it costs to get to space in the first place. 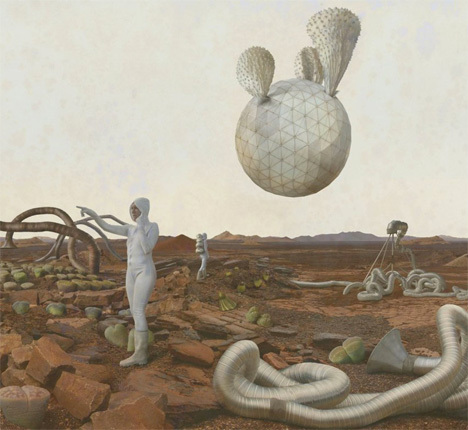 This series of fantastical images doesn’t even try to be technically correct or scientifically possible, but it was commissioned by NASA all the same to represent a vision of existence on Mars. The artists used photo-mosaic panoramas of expeditions by the rovers Spirit and Opportunity as backdrops for surreal scenes. 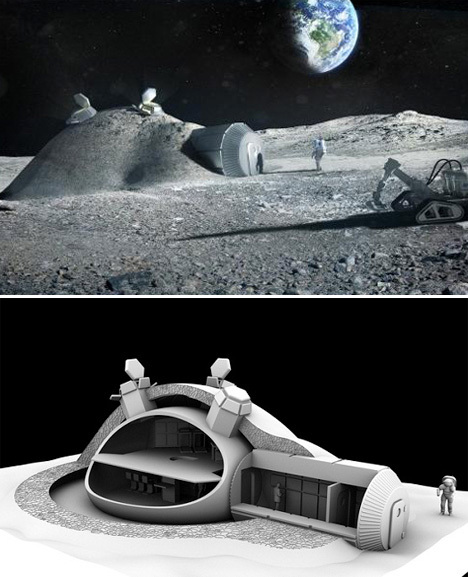 Architecture firm Foster + Partners, responsible for many iconic buildings on Earth, have designed a four-person lunar base that uses 3D printing technology to ‘print’ a protective layer of locally-sourced lunar soil over an inflatable dome. Commissioned by the European Space Agency, the project takes a look at the feasibility of actually building such a structure using currently existing technology. A transparent sphere houses living spaces for lunar residents in this concept by Royal Haskoning Architects, offering inhabitants unlimited views of the awe-inspiring setting if not a whole lot of privacy. But then again, who needs privacy when you live on the moon? A protective screen rotates around the sphere to protect the inside from the harsh rays of the sun. 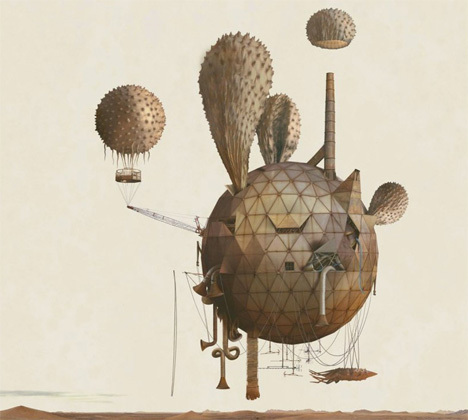 The sphere is envisioned as a mini-Earth with its own oxygen supply and various levels that inhabitants can simply float between rather than taking the stairs. 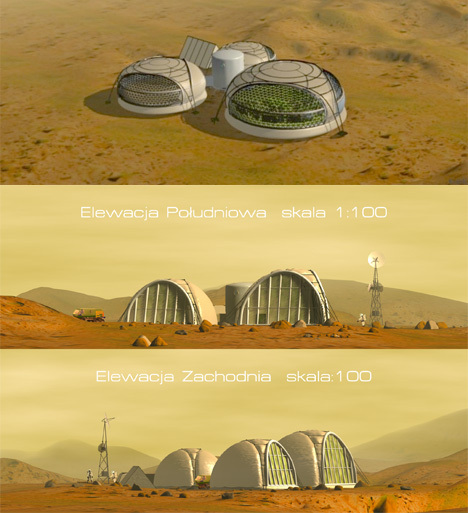 Husband and wife design team Janek Kozicki and Joanna Kozicka have created a number of concept designs for Martian bases generally powered by either a radio-isotope generator or a small nuclear power plant, along with practical architectural guidelines for building on other planets. 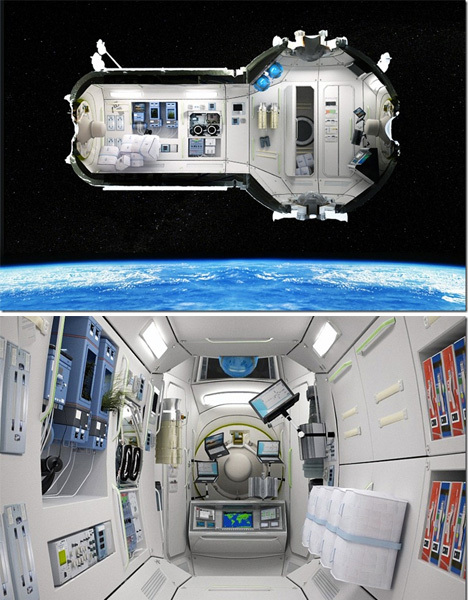 The design pictured above, by Kozicki, is a modular setup that would start with a single pod and grow with subsequent trips to and from Earth to ultimately accommodate several dozen people. 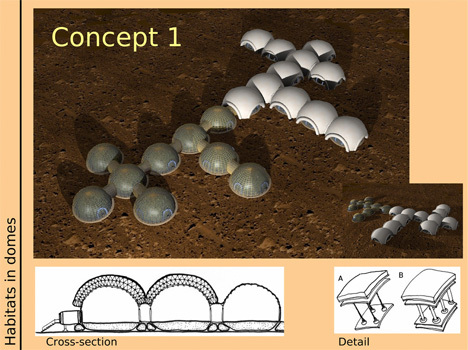 Kozicka’s solutions include inflatable pods that are lightweight, easy to deploy, and ultimately offer a bigger payoff in terms of square footage for the size of the load sent to Mars. The designs address the sociopsychological problems that the couple identified in relation to living on another planet, avoiding isolated and confined environments in favor of large, comfortable spaces that let in sunlight and allow contact with nature. 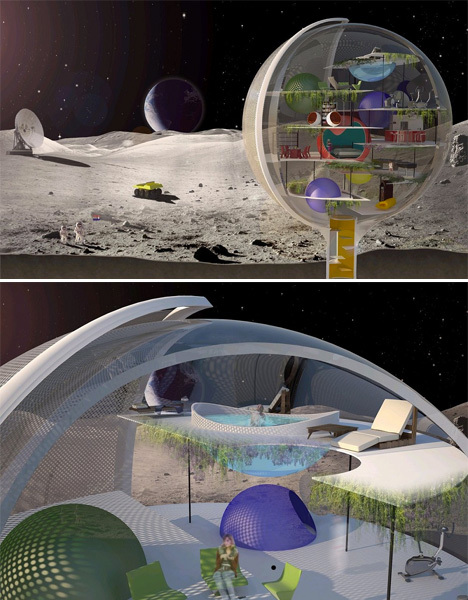 NASA’s Lunar Architecture Team is working on a design for a permanent lunar outpost that could be set up the next time humans land on the moon. 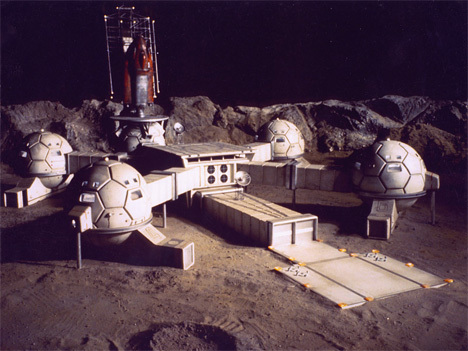 Designed for Shackleton Crater, located at the south pole of the moon, the habitat would consist of larger modules sent ahead of time on a cargo lander. 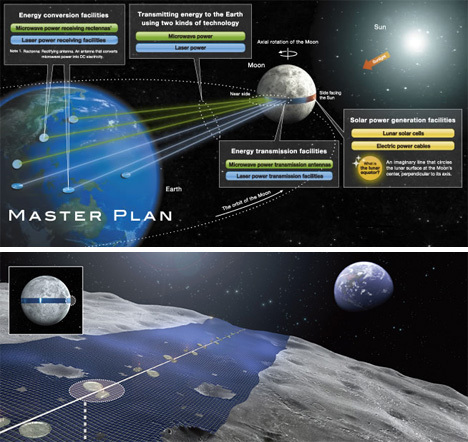 The Luna Ring concept would put permanent solar collectors around the moon’s equator like a belt, with solar cells collecting energy that would then be beamed back to Earth via microwave power transmission antennae. A team of astronauts would supervise the robot construction workers carrying out the installation process. 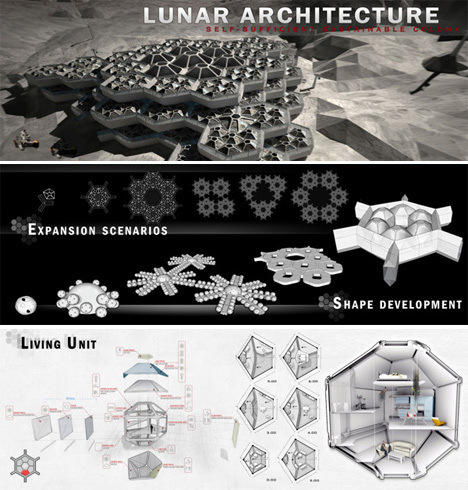 A fractal design for a lunar base by Hatem Al Khafaji of Dubai makes it easy to expand the available space as needed using a system of seven modular components of living pods, air locks, corridors and connectors. Layers of these modules would be placed around a central ‘heart’ and continuously stacked by teams of robots and human workers.